Automation, technology, neuromarketing! Get right to it! We’ve promised short facts - here you go: 19 short insights from GRIT Report* about what to expect from marketing research industry in the nearest future. 1. The first and most important insight is that companies are decisively leaning towards automation of major research processes. Around 60-70% of companies have already automated or are planning to automate charting and infographics, analysis of text and survey data, analysis of social media data. The figure for sampling is a little bit smaller but still impressive: 55% of suppliers and 43% of buyers. 2. Another vivid example of the fast pace of automation in the field of market research is that by the middle of 2019 even such complicated tasks as report writing, project design and matching service suppliers and buyers will be automated. By the way, our CoolTool platform already allows suppliers of research services and potential buyers to find each other. 3. Even though not many companies are currently using (around 17%) or are planning to use (around 20%) neuromarketing it becomes more and more popular. By popularity, neuromarketing stands in line with such advanced techs as research gamification and crowdsourcing. 5. Many companies lack expertise in doing market research. That’s why within the next few years they will try to boost their capacity in spheres of data storytelling, data visualization, adjusting research methods to business goals as well as an implementation of new technologies. 6. The most widespread techs adopted by companies within their research activities are mobile surveys, mobile ethnography, and mobile qualitative researches. At the same time research gamification, neuromarketing, eye tracking, social media analytics, big data analytics, micro surveys, online communities and wearables-based research will be the fastest growing areas in the nearest future. 7. Marketers will have a greater influence not only on consumer’s choice but their behavior as well. All this will become possible with neuromarketing tools which will allow them to collect more precise information about not only what people say and think about the product but how they feel about it. 8. 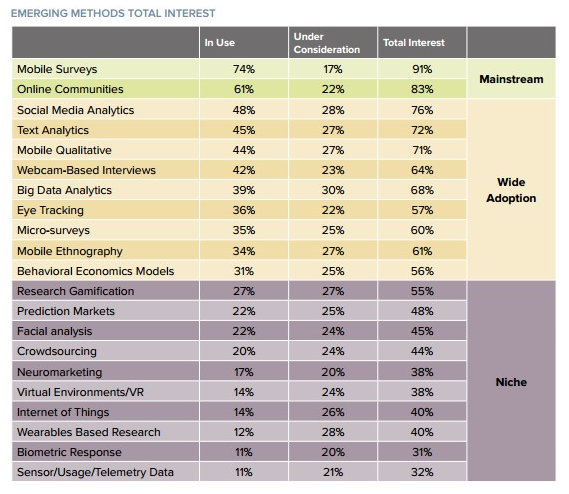 Mobile-based techs will be of outmost interest to research companies and their customers. 9. Eye tracking is becoming more widespread with 36% of companies already using it and 22% considering to use it in next couple years. The level of general interest towards eye tracking is comparable with that towards webcam-based interviews, micro-surveys and mobile ethnography which indicates the gradual but consistent migration of companies towards neuromarketing tools. 10. Dynamic of interest towards neuromarketing among research companies and their clients grew 5% since 2014 which is certainly a positive trend. Usage of neuromarketing related tools such as eye tracking and facial analysis also demonstrated positive dynamic of growth since 2014. 11. The proposition of neuromarketing and related tools by research companies as well as demand for such tools among their clients will remain at the approximately same level. It means that the market of neuromarketing research is quite balanced, and service providers may expect good revenues. 12. Neuromarketing, as well as such related tools as eye tracking and facial analysis, are most popular among European companies, with businesses from North America and Asia-Pacific region falling slightly behind. 13. By the end of 2017, charting, basic analysis, and sampling will be most probably handled by automation platforms in the majority of leading research companies. In 2018, automated analysis of image and video data will prevail in the majority of marketing research businesses. In 2019 some of the project-oriented tasks will become also automated. 14. 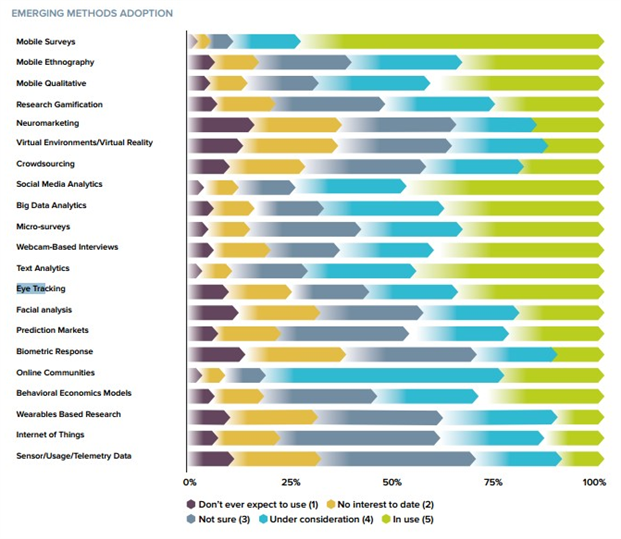 Research service providers, as well as consumers, consider that the biggest challenges for the future of marketing research lay within data privacy legislation (protection of data collected from consumers through different sources), single source networks as sample sources as well as virtual reality will replace PCs and mobile devices making the collection of data from consumers more complicated. 15. 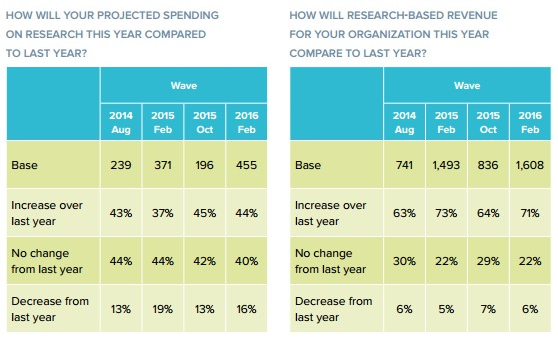 The vast majority (71%) of marketing research companies expect research-based revenue to increase in 2016 compared to 2015, while only 44% of research services consumers foresee an increase in research budgets. 16. The dipper marketers will dig into consumers’ data the more questions it will raise from the point of view of data privacy. In the nearest couple of years, security of personal data will become an even more serious issue, and companies who won’t respect data privacy will face great consequences. 17. Solutions in the sphere of combining consumers’ behavior data and data related to their emotional interaction with the product will become more popular. 18. Combining new sources of data with traditional marketing research techniques, for example integrating surveys into mobile devices, will become a reliable way to remain competitive for many market research companies. 19. Technologies, which give marketers a better understanding of how consumers really think and behave will give them the possibility to have more strategic roles within companies. As you can see marketers are eager to utilize cutting-edge technologies to know more about and connect with consumers. So, be prepared and keep an eye on tech solutions which may provide you with advantageous data about your potential customers. And remember “Consumers don’t connect to brands, humans do”. If you have more time to spare on reading useful insights, we would also recommend you to look through the full GRIT report following this link. 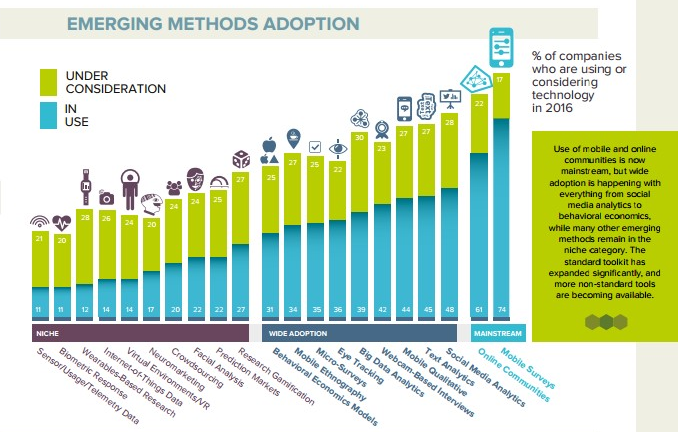 * GRIT Report explores trends in marketing research technologies, which companies have already introduced or are planning to introduce in the nearest future. 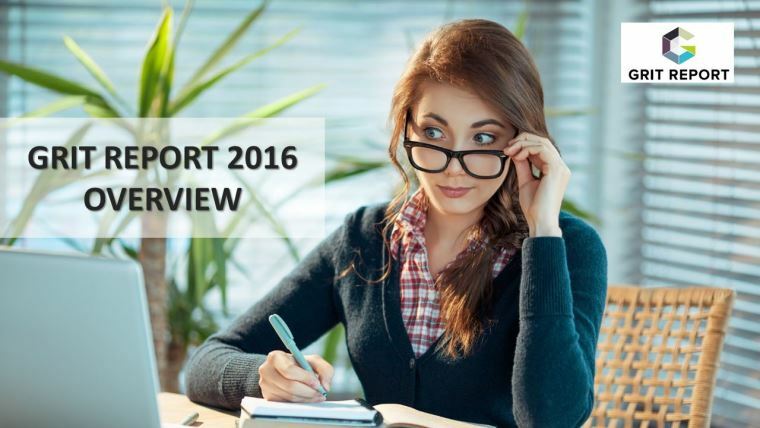 The Report relies on the comprehensive surveys of 2144 companies conducted in 70 countries. Among those companies are research service providers as well as consumers.